We’re at midcourt, and the ball is about to go up…it’s Monday Tip-Off! Start your week here at the NLSC with a feature that’s dedicated to opinions, commentary, and other fun stuff related to NBA Live, NBA 2K, and other basketball video games. This week, I’m tipping things off with a few thoughts on how basketball gaming can be a bit of a grind. As much as we enjoy basketball gaming around these parts, I don’t think many of us would argue that it isn’t a grind at times. Whether it’s playing through a full NBA season, building a collection of quality cards in the team building modes, or turning our avatars into superstars, it’s a lengthy process. This is especially true if you’re playing with full length quarters. The obvious solution is to set shorter quarter lengths, and make use of the simulation function in modes where it’s available, but for various reasons, those options aren’t always desirable. Even if you do streamline the experience, the chances of burnout are high. That’s because we pack so much basketball gaming into a single year, in order to get the most out of a title before the next one is released. With other genres of video games, you can generally take your time, and discover the replay value at your leisure. Most games can easily be finished in a much shorter time than it takes to complete one full season playing on twelve minute quarters. Even if you do feel as though you’ve had a full and satisfactory experience with a basketball game, within a year you’ll be starting from scratch and having to do it all over again. The question is: what changes could be made so that basketball games feel like less of a grind? When it comes to franchise modes, as noted above we do have a few tools at our disposal. We can simulate games of our choosing (and even control and intervene in simulations), and select shorter schedules and/or quarter lengths to make the season go faster. 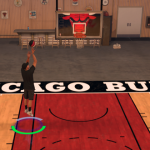 Additional options such as the accelerated clock feature in NBA Live and stats normalisation in NBA 2K are extremely useful for those of us who would prefer everyone’s numbers to look realistic, while also speeding things up. I enjoy the challenge of playing full seasons on twelve minute quarters, but the older you get and the more responsibilities you have, the less feasible that becomes. Given the length of the NBA season, I sometimes feel that the 80 years that can be played in MyLEAGUE and MyGM is overkill. In fact, even Dynasty’s 25 seasons sets a limit that most basketball gamers probably won’t reach, at least without a lot of simulating. That’s not necessarily a bad thing, though. It’s far better to have a maximum number of seasons that’s much higher than most gamers will require, rather than a limit that leaves everyone wishing that the mode ran a little longer. Again, it’s not like we don’t have the tools to speed things up if we want. Of course, you could argue that the NBA season in basketball video games feeling like a marathon is an inherent part of the experience, and in some ways, an important part of the charm (and challenge). Conceptually speaking, outside of the aforementioned methods of speeding up the process, there isn’t much that can be done to change it. 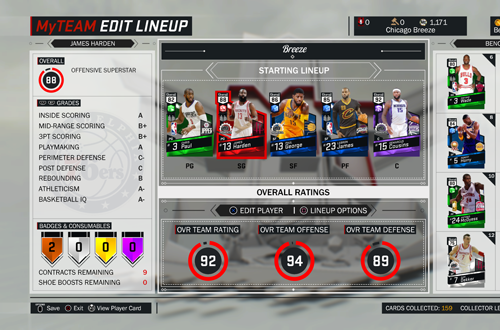 Things are a little different when it comes to building a team in the card collecting modes, or turning your player into a star in the career modes. Those modes involve a different, more arduous grind. To that end, I believe they could stand to be a lot kinder to basketball gamers. I’ve previously discussed how starting over in a new game’s career mode can be painful. On top of missing the situation you previously found yourself in, it’s tough to find yourself back at the bottom, unable to do the things you’re accustomed to doing with an upgraded player. NBA 2K in particular is very harsh with its starting ratings for new players. Without any ratings upgrades, Badges, or Virtual Currency carrying over from year to year, you’ve got to repeat the process of grinding hard to get back to the level you were at in the previous game…then do it all again, twelve months later. If you bought VC to lessen the grind, that’s even more money you’ll be spending. 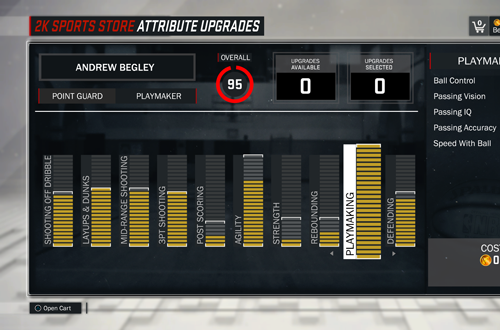 Issues with the Archetypes in NBA 2K17 aside, the upgrade system in MyCAREER is pretty solid. Microtransactions will only take you as high as 88 Overall, so you’ll need to train in the mode itself to improve beyond that. 88 Overall is definitely good enough to allow your MyPLAYER to have an impact, and the limit cuts down on balance issues in the connected online modes at launch. The “Doin’ Work” meter could stand to fill a little quicker though, and the starting ratings should be higher. After all, 55 Overall doesn’t exactly scream “future star”. You also shouldn’t have to slowly grind up your Rep in MyPARK, in order to max out at 99 Overall. Another solution would be to reward gamers with a loyalty or “returning player” bonus. Look, I know that there needs to be a challenge and room for growth at the beginning of career modes, and microtransactions have obviously become an integral part of NBA 2K’s profits. However, allowing a one-time transfer of VC from last year’s game to the current release, awarding a generous set amount of VC to immediately boost a new player, or even applying an automatic upgrade based on progress made in the previous game, would offer a head start and demonstrate a lot of goodwill. Starting over each year would become a much less frustrating experience. A similar approach could be taken with the team building modes. I’m not suggesting that all of your cards should transfer over; that would be cheap, unfair to new gamers in terms of the online challenges, and probably rather boring. However, considering how weak your initial set of cards always is, a suitable reward for amassing a large collection in the previous game might be the ability to select three to five of your favourites and immediately add them to your collection in the new game. It would show a lot more goodwill than receiving a quality card for pre-ordering the game, only to have it disappear after a few games because it’s a Free Agent/short term card. There obviously needs to be balance here. Returning player bonuses shouldn’t completely eliminate any challenge; there has to be a limit on how much of a shortcut you can take. Limiting the number of carryover cards, restricting transfer of VC to one way, one time, and still leaving plenty of room for improving your MyPLAYER, would all be essential measures to preserve competitive balance. Again, a maximum of five carryover cards strikes me as an appropriate amount. 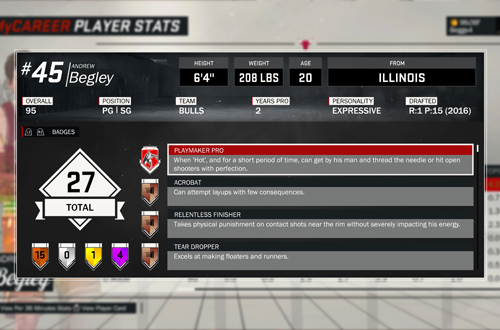 With the MyPLAYER boost, I’d suggest capping it around 75 Overall, on par with some of the top rookies. The cap for microtransaction upgrades could perhaps also be lowered accordingly. Basically, I think the grind would feel less tedious, and there’d be much less frustration with starting over in a new game, if we had something to show for our efforts in the previous year’s title. In other genres of video games, we can keep a save file that reflects all of our progress and accomplishments. We can load up that save to replay the final boss fight, or continue gameplay after beating the game. With annual releases and eventual server shutdowns, we generally have to keep moving forward with basketball video games. Returning player rewards would allow us to benefit from our previous efforts, and continue to build upon their legacy. Great games of any genre are ones that you want to play over and over again, sinking hundreds of hours into. They shouldn’t be too easy to breeze through, or attain 100% completion in. However, to be an enjoyable experience, a great game also has to progress at a rate that doesn’t feel unfair or tedious, especially when we’re talking about sports games that have annual releases. The basketball gaming community is a passionate one, but too much grinding each year does wear on us, and dampens our enthusiasm for hitting the virtual hardwood. A few changes could go a long way in making the grind feel less of a hassle, and more fulfilling.